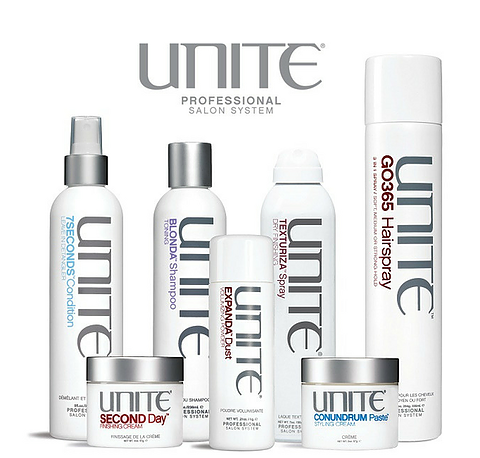 We proudly carry Ouidad and Unite hair products. Since 1982, Ouidad (pronounced wee-dahd) was the very first stylist and salon owner in the country to specialize in curly hair. Today, editors at national fashion and beauty magazines consult Ouidad regularly and consider her to be the "Queen of Curl." Ouidad combined scientific knowledge with an understanding of curly hair’s special needs. She takes an active part in formulating and creating her line of protein and vitamin enriched hair products that work with antioxidants to make curls defined, soft, shiny and manageable. All curls can be healthier, shinier, and more manageable with Ouidad. Curly hair is lively and fun. Taking care of it doesn’t need to be a burden and take hours of your time. Unfortunately, many of us are guilty of purchasing hair care products that aren’t right for our curls. These products then end up in a "hair product graveyard." In most cases, people are selecting formulas that are inappropriate for their hair type or using the products incorrectly. Curly hair requires specific products, and Ouidad’s products are specifically designed for curly hair. And they are always satisfaction guaranteed! As the first-ever range developed specifically for curly hair, Ouidad products create beautiful and healthy curls for life. Ouidad formulations are lightweight, gentle, moisturizing and water-soluble and work from the inside out to transform hair into its healthiest condition. Ouidad products feed curly hair what it needs---moisture, protiens, vitamins, and amino acids--- to help it look its best today and tomorrow. Ouidad products enhance and define curls, not suppress them with heavy oils or waxes.